Note: all page numbers and citation info for the quotes below refer to the Simon & Schuster edition of Titus Andronicus published in 2005. A mother’s tears in passion for her son. O think my son to be as dear to me. That died in honor and Lavinia’s cause. Thou art a Roman; be not barbarous. The cruel father and his traitorous sons. A Roman now adopted happily. O noble father, you lament in vain. Is not my sorrow deep, having no bottom? “But”? How if that fly had a father and mother? Came here to make us merry! And thou hast killed him. Because she was enforced, stained, and deflowered? And with thy shame thy father’s sorrow die. There’s meed for meed, death for a deadly deed. These broken limbs again into one body. Now have you heard the truth. What say you, Romans? Have we done aught amiss? Fredericksen, Erik. 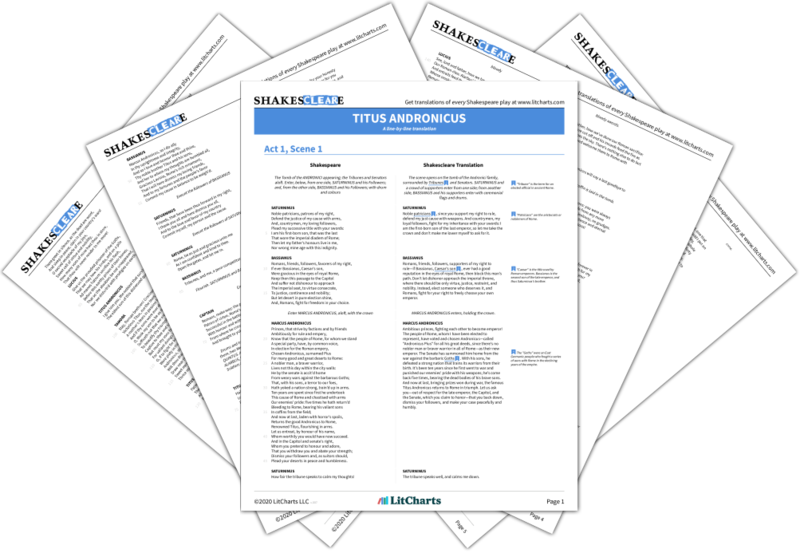 "Titus Andronicus Quotes." LitCharts. LitCharts LLC, 26 Oct 2013. Web. 20 Apr 2019. Fredericksen, Erik. "Titus Andronicus Quotes." LitCharts LLC, October 26, 2013. 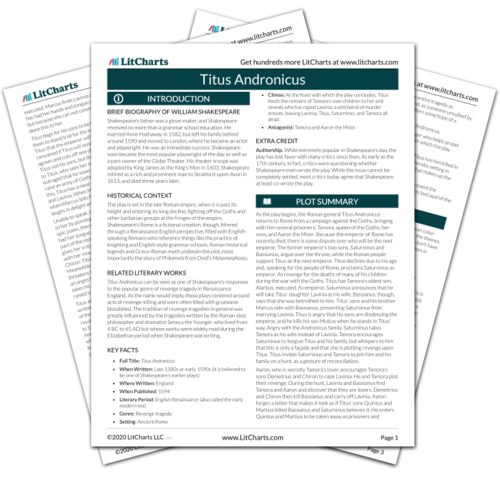 Retrieved April 20, 2019. https://www.litcharts.com/lit/titus-andronicus/quotes.